Orbyter* is a Python toolkit for easily spinning up Docker-based development environments for machine learning projects. These are tools that we have been developing internally at Manifold to help our own team deliver projects in the best way possible. We've open-sourced these tools with the goal of helping data science teams adopt Docker and apply Development Operations (DevOps) best practices to streamline machine learning delivery pipelines. * Orbyter used to be called Torus. 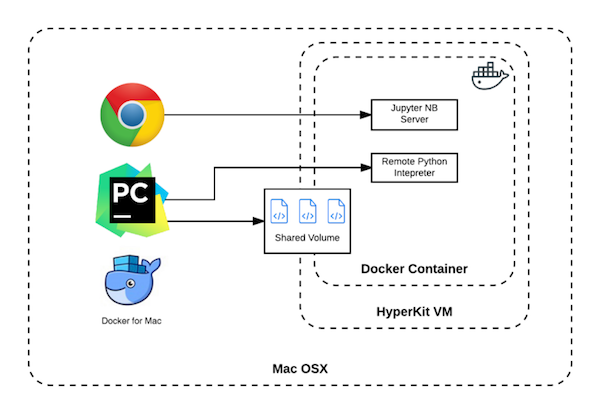 By moving to a Docker-first workflow, machine learning engineers (MLEs) can benefit from many of the significant downstream advantages in the development lifecycle in terms of easy vertical and horizontal scalability for running workloads on large datasets, as well as ease of deployment and delivery of models and prediction engines. Docker images running in containers provide an easy way to guarantee a consistent runtime environment across different developer laptops, remote compute clusters, and in production environments. While this same consistency can be achieved with careful use of virtual environments and disciplined system-level configuration management, containers still provide a significant advantage in terms of spin up/down time for new environments and developer productivity. However, what we have heard repeatedly from the data science community is: "I know Docker will make this easier, but I don’t have the time or resources to set it up and figure it all out." At Manifold, we developed internal tools for easily spinning up Docker-based development environments for machine learning projects. In order to help other data science teams adopt Docker, we open-sourced our evolving toolkit as Orbyter. We wanted to make it dead simple for teams to spin up new ready-to-go development environments and move to a Docker-first workflow. The Orbyter package contains a Dockerized Cookiecutter for Data Science (a fork of the popular cookiecutter-data-science) and an ML Development Base Docker Image. Using the project cookiecutter and Docker image together, you can go from cold-steel to a new project working in a Jupyter Notebook with all of the common libraries available in under five minutes (and you didn’t have to pip install anything).